As businesses move IT applications to the cloud, employees expect to be able to access enterprise applications anywhere - whether that's throughout the building where they work or in the back of a taxi on the way to a meeting halfway around the world. And they expect their enterprise IT department and their mobile operator to ensure it all works. However, actual user experience varies depending on network, and access to enterprise applications is generally limited. Ericsson (NASDAQ: ERIC) is removing barriers to enterprise mobility by enabling mobile and converged operators to deliver integrated cloud, connectivity and communications as-a-service to their enterprise customers. The Ericsson Radio Dot System, launched in September, 2013, addresses the indoor coverage and capacity challenge. Now with the launch of Ericsson Mobile Unified Communication, operators can deliver standards-based, operator-branded Unified Communications as a Service (UCaaS). Enterprise users will enjoy a seamless and consistent user experience across networks, while securely accessing enterprise services from any mobile device. Diane Myers, Principal Analyst, VoIP, UC, and IMS, at Infonetics, says: "By incorporating unified communications in the network, Ericsson enables operators to address enterprise requirements for integrated, standard-based solutions supported on any network and any device. The timing is excellent as operators worldwide are starting to pursue growth opportunities in enterprise services." Magnus Furustam, Vice President and Head of Product Area Communication Networks, Ericsson, says: "Ericsson's vision of the mobile enterprise goes well beyond supporting remote workers. This launch is an important step in our mobile enterprise strategy that delivers integrated cloud, connectivity and communications as-a-service via operators. Ericsson Mobile UC solves the challenges facing CIOs, replacing a complex ICT infrastructure with a simplified network, managed to the operator's carrier-class standards." Employees will enjoy high-quality voice and HD video conferencing services with full access to their corporate directory wherever they are on any device. Customers, colleagues and partners, can see each other's availability (as individuals or by group), via presence capabilities. Support personnel can provide in-browser guidance to customers. All of these features are accessed using your mobile phone number and can be seamlessly transferred between user devices while in session. Mobile UC leverages many of the technology investments that operators are already making in their mobile broadband and fixed networks, including: LTE, IMS, voice over LTE (VoLTE) and Rich Communication Services (RCS). The first release of the new solution will be available in Q3 2014. 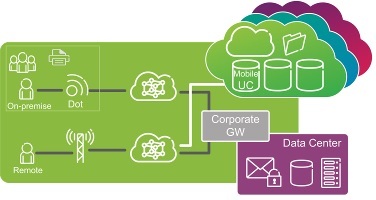 Mobile UC will be running live in the Communicating Enterprise station in Ericsson's booth at Mobile World Congress 2014. Ericsson is the IMS market leader having signed more than 110 commercial IMS contracts worldwide for both fixed- and mobile accesses, whereof around 70 IMS systems are running live with commercial traffic. In addition, Ericsson has around 270 IMS tests-and trial contracts. Having launched the world's first commercial IMS system in 2005, Ericsson has gained extensive IMS deployment knowledge and experience.